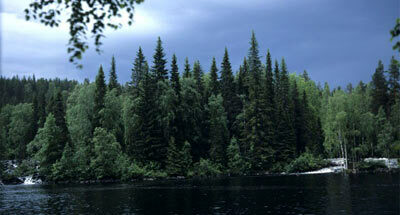 The Zapovednik lies within the Baltic shield on the east-facing of the Western-Karelian Upland. Characteristic are selgas, raised massifs with cliff complexes, and also ozas of aquatic-glacier origin. The elevations do not exceed 250 m above the sea level. The relief depressions are associated with ancient fractures and are most frequently occupied by moraine sediments. 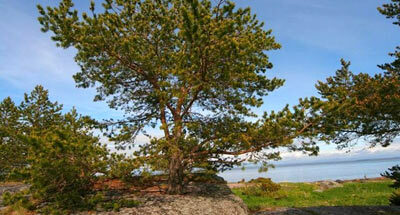 There are numerous lakes, the largest being Lake Kamennoye (9.6 thousand ha); the length of shoreline is 193 km. The only river is Kamennaya, 25 km long. The bulk of the territory is little-disturbed woodland. Pine forests of different types prevail (69.6%): those with green moss (bilberry and cowberry), lichen pine forests, and those with sphagnum. Spruce forests are less abundant (10.3%), and are concentrated mostly in the valley of the Kamennaya River, stretching along the streams. Mires account for about 20% of the area: Karelian ring mires (aapa type), mesotrophic bogs with sparse pines, oligotrophic moors. Mires mostly do not cover large areas (10-50 ha). Some plants of the Zapovednik are listed in the Red Data Book of the Russian Federation, including water lobelia, spurred coral root, etc. Among the mammal dwellers, carnivores are the most diverse, including common marten, ermine, least weasel, otter, wolf, brown bear, lynx, wolverine. Ungulates are represented by the moose and the forest form of wild reindeer. The deer population dwelling in the Zapovednik also uses the Finland territory as well. Three following rare avian species nest in the Zapovednik: white-tailed eagle, osprey, golden eagle. The bean goose and whooper swan have remained in the Zapovednik. Tetraonidae are diverse, including the hazel grouse, capercaillie, black grouse, willow grouse. Water bodies contain valuable fish species. 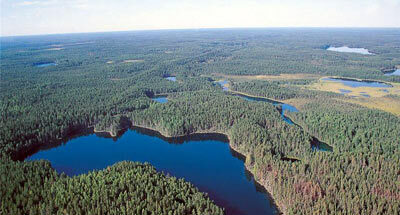 The population of lake salmon in the lake Kamennoye is one of the five existing in Karelia. In 1990 the Zapovednik was granted the status of an international reserve as the Russian part of the Russian-Finnish Zapovednik "Druzhba". 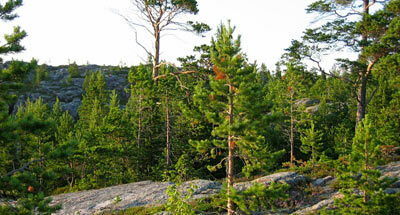 The Finnish part consists of five separate specially protected nature areas.